Depression and mental illness are very difficult topics to talk about. These topics are finding a place on stage and film to help bring awareness as a means of entertaining while informing. In Meghan E. Jones' Trapper, presented by The Shelter, Jillian finds herself attempting to regain control of her life after a short stint in a mental ward following a failed suicide attempt. Written by Meghan E. Jones, Trapper follows gossip website writer Jillian as she goes back to work with a story that could bring great notoriety to the website but bring down a struggling celebrity friend all while trying to regain control of herself. Trapper is an interesting story of morality, image and the way society treats people via words on social media. Jones’ play is an important story. But important doesn't always translate to perfect. While it leans a bit closer to the positive overall, the negative does weigh it down. Displaying mental illness on stage can be mightily difficult but by incorporating the breaks of sanity and bursts of pain was used brilliantly. It truly allowed the moments where Jillian lose herself to become defined. When it came to crafting characters, Jones’ bunch are quite interesting. Jillian is the central character and seemed to have the most care taken. As office gay and all-around good guy Todd is a strong and vital character as his actions are real and warranted. From there, things get a bit wonky. The subject of Trapper walks a fine line and the way certain characters talk to Jillian is an unfortunate treatment of a person in pain. From boss Rory claiming he wants to help Jillian but immediately falls into a selfish psyche to Lisbeth who is just a cruel and hurting individual, as shocking as it sounds, their actions and reactions felt false. People are cruel but lacking awareness to the situation at hand detracted from the journey the play was offering. Yes, in a theatrical setting it added conflict but there must be a different way of bringing conflict into Jillian’s story. Additionally, the tone of the piece struggled to find itself due to the drastic comedic shifts. Moments of humor are more than welcome in drama but the way Jones and director Jenny Reed implemented felt as if they were separate from the play. The biggest shift came with janitor Ludmilla. 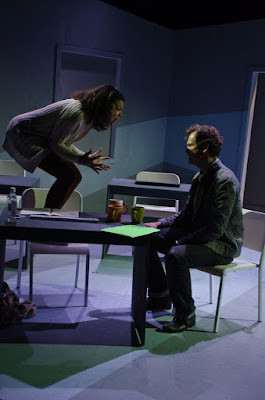 Her bits added little to the overall arc of the story and are ripe for the cutting, as the play, running almost two and a half hours, is desperately seeking streamlining. Being a lead character can be daunting in itself but with all the elements thrown in, Morgan McGuire has a mammoth undertaking. McGuire as Jillian has an incredibly difficult role to play. Balancing normalcy while maintaining sanity is no easy task. Despite some strange twists the text takes, McGuire does a noble job in the part. You see the struggle within Jillian through McGuire’s performance but you can’t help but want to shake her as Jillian, and McGuire, make some baffling choices throughout the journey. Todd the hipster graphic designer may be the most well-rounded character in the play and is smartly matched with the most well-rounded actor on stage. Noam Harary finds veracity in Todd. He’s naturally funny but also has an enormous heart. When it comes to hearts, Matthew Sander’s Rory seems to have a semblance of one. Once we learn of Rory’s motives, your opinion of the character drastically changes. Sanders is able to make that switch well. Kelley Gates, Jessica O’Hara-Baker, and Jennifer Fouche take on the characters that have cartoonish elements to them. Though it’s very likely these characters are how Jillian projects them to be, in a realistic setting, they have over-the-top personalities. As the vile hate-spewing Lisbeth, O’Hara-Baker gives her character no redeeming qualities. Why Jillian doesn’t pick up the keyboard and smack her straight in the face is beyond me. Playing Jackie Batiste, the fallen Hollywood starlet, Kelley Gates is essentially seen in two different variations. Though we learn what brings on the change for the Act II character, the timeline of effectiveness seems a tad off. Jennifer Fouche plays a trio of characters, each proving her worth as a performer. There are great intricacies in Jenny Reed’s direction. Despite some flaws in the script, Reed manages to overcome them through her vision. With the sharp linear lines of the set, it helps to box Jillian in. You can’t help but wonder what would happen if it was even tighter, giving Jillian even less of an escape. Regardless, the grey monochromatic set was interesting with its irregular angles. The detail that the team put in the costume design was quite brilliant. Each actor had their own color that was reflected in their costumes. It was simple yet effective. The only time it deviated from this was when Jillian wore the blue dress, straying from the brown and tan regular-wear. This moment helped to define that this image was not the true Jillian. The lights and sound by Mike Faba and Daniela Hart respectively worked in tandem to give Jillian her moments of hurt. These bits were essential and were quite effective. Trapper is a play that in a few drafts from now can be extremely significant. The struggle of depression is something that will forever be a common theme in society so having a play that successfully displays the disease will be vital. Meghan E. Jones and The Shelter are well on their way.